In terms of concealer, I swear by my budget and drugstore alternatives, which I will be showing you some other time. But just because I love the cheaper alternatives so much, does not mean that the higher end stuff isn’t great too. I just was a little late to the game trying all these. Because why spent over €20 for a concealer when you have ones that are just as good for under €5? Still, there are a few that I found worth to splurge on and this is them. None of the concealers in this picture are truly high end. There is no YSL Touche Éclat, nor any of the more luxury brands here. All of my favorite high end concealers fall into that middle range. Let’s call them the ‘Sephora brands’, because all of these can be found at Sephora like stores. Kat Von D Lock It Concealer Crème – My current concealer of choice and one I love because it has a great shade match. It’s also not too drying, has a high coverage and a little goes a long way. It can be a bit difficult to blend with a brush, but with a beauty blender type sponge this works very well. I hope to put up the review for this one soon. Tarte Shape Tape Contour Concealer – Who has not yet heard of Tarte’s Shape Tape? Unfortunately only available from Ulta, which means it is very difficult to get your hands on if you’re not in the US. I haven’t used this much, but with so much hype around it, I knew I had to try it. It is super full coverage though, so this will be great to cover those dark circles. Urban Decay Naked Skin Concealer – A much more lightweight concealer is Urban Decay’s Naked Skin. Another hyped up product, but that not many people rave about anymore. But this is a great product. It covers well, but is still lightweight. I reviewed this concealer in this blog post. And because I love it so much, I can’t wait to try the new All Nighter concealer. Too Faced Born This Way Concealer – The Born This Way products are supposed to be great for drier skin types, which is what I have. So I decided to give this a whirl. I used it for a little while, but haven’t been able to give it my true verdict just yet. The shade is a good match though and this is a good middle ground between something more emolient and a concealer with a heavier coverage. NARS Radiant Creamy Concealer – Another cult favorite that I reviewed a while ago and have repurchased in a lighter shade since. I used to have this in Custard which was a good match over the summer time, but I prefer my concealer to be a touch lighter and went with Vanilla for the repurchase instead. This product came recommended by an MUA at Sephora when I got my makeup done in store once and I fell in love. I raced through my first tube though as this is notoriously quick to run out. What is your favorite high end concealer? 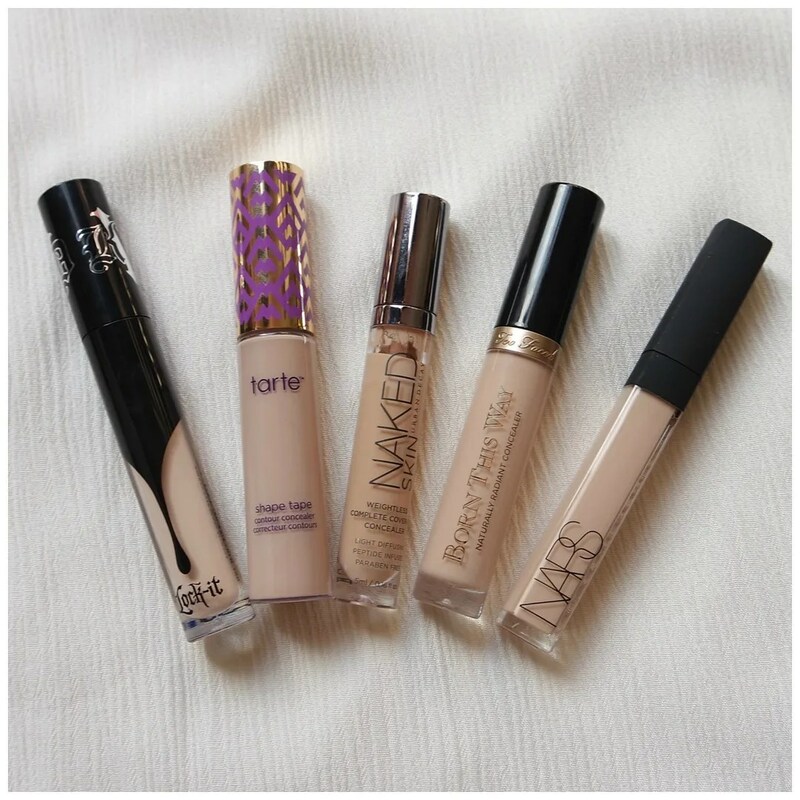 Great post, from this list, i only tried the naked skin concealer and i agree with what you said about it!! I hope to buy the shape tape concealer soon!! Shape Tape is a lot fuller in coverage but I love how blendable the UD is. LOVE Tarte shape tape, but not so much the others. The NARS was so drying. IDK why ppl are so obsessed!!! IDK didnt work for me lol. But I LOVE the Charlotte Tilbury Retoucher! I don’t mind the NARS, but then again, I always use an eye cream before I do my makeup.